The studios we offer are 20m2-30m2big and are located only on the first and basement floor with a view to the garden. Studios Type 1 consist of a bedroom (double bed, wardrobe, TV stand with a TV, mirror stand, chair), hallway, a bathroom with a toilet. They have a view to the garden, but without a balcony. Suitable for accommodating up to 2 adults. 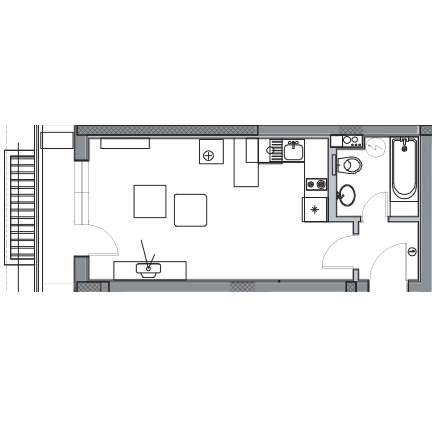 Studios Type 2 consist of one room with a kitchenette, a table with chairs, a double bed, a wardrobe, TV stand with a TV, hallway, a bathroom with a toilet. They have a view to the garden, but without a balcony. Suitable for accommodating up to 2 adults. Studios Type 3 are around 35 m2big, located on the 1stfloor, with a view to the pool. They consist of one room with a kitchenette, a table with chairs, a double bed, wardrobe, TV stand with a TV set, hallway and a bathroom with a toilet. They also have a balcony. Suitable for accommodating up to 2 adults and one child no older than 8-10 years.